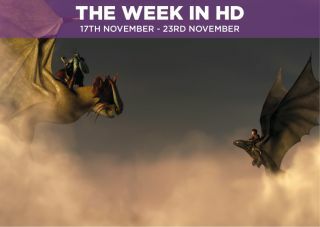 The Week in HD - Monday 17th November | What Hi-Fi? The Transformers return in this 'soft' reboot of the franchise which sees 'Marky' Mark Wahlberg take the reins from Shia la Beouf. After the events of Dark of the Moon, the Autobots find themselves the target of a black ops team led by Kelsey Grammar who declares all robots – good or bad - evil. He's not the only one who wants the Autobots as another transformer called Lockdown wants Prime in exchange for the 'seed', a powerful weapon that threatens the existence of earth. If you're a fan of the previous trilogy, you'll find that Extinction doesn't sway far from the established formula. Some of the action is spectacular and Stanely Tucci stands out amid the pyrotechnics. What is new, however, is the Dolby Atmos soundtrack which we've tested and certainly adds another dimension to the film's sound. As good as the original Dragon? Hard to say. What this trip back to the island of Berk shows is that Dragon is a well-drawn world that's full of emotion and stunning flying sequences. This time Hiccup (Jay Baruchel) is a little older and wiser, and discovers the whereabouts of another dragon rider who may be linked to his past. All the while, another viking called Drago (Djimon Hounsou) wants to capture all the dragons to create an army. It's safe to say Hiccup doesn't agree with this and a war erupts that will have repercussions for all involved. There are even more troubles at home, with Arthur's PTSD and​ addictions, and Polly's search for her lost children threatens to tear the family apart. In the midst of it all, the hateful DI Campbell returns to exact his revenge upon Tommy. The violent-yet-stylish world, the stunning cinematography, superb acting, and a gorgeous anachronistic soundtrack that now boasts PJ Harvey alongside Nick Cave and Jack White – this is a series to put at the top of your 'to watch' list. Another meta-action/comedy sequel from Phil Lord and Chris Miller that boldly announces from the off that it's going to do what every sequel does: be bigger and louder. While it's a running gag that the directors wring more than their fair share of jokes from, there's a sense that, like the first film, you won't remember too many jokes a few days later. Despite that, Tatum and Hill as the two leads are enjoyable to watch (especially the former), while Hill has a fight towards the film end that's completely over the top and silly. There have been many films that have copied the Escape from New York template and you can add The Purge: Anarchy to that list. Frank Grillo takes the Snake Plissken role, a man out for revenge who leaves his house on Purge Night to get it. He gets more than he bargained for, however, when he comes across a family in need of help and he has to lead them to safety. The Cold. The Dunphy family are laid low by a cold thanks to Phil, while Jay and Gloria try to encourage Manny with his football exploits. Spirit of the Goat. A resurrected serial killer (what else?) is targeting the offspring of the rich and calling himself 'The Goat' in this week's Gotham. This brings up some unexpected memories for Det. Harvey Bullock who had an encounter with the 'Goat' in his younger days. The oldest 'friendly' in international football gets another run out for the first time since 1999. Expect a raucous atmosphere and a match that may be closer than you'd think, despite the perceived gap in quality between the two teams. This encounter will be anything but friendly. Going Rogue. What happens when a bank thief is armed with a deep-freeze gun? Some chilly action and some 'stay frosty' puns (we hope). Wentworth Miller (he of Prison Break fame) guest stars as diamond thief Leonard Snart a.k.a Captain Cold in an episode that crosses over with fellow superhero show Arrow in the form of tech wizard Felicity Smoak joining the cast. The Prodigal Son Returns. It's the season finale of The Leftovers as the Guilty Remnant group throw the town of Mapleton into chaos. And just who is the "Prodigal Son" of this episode's title? Tonight on MasterChef judges Monica Galetti, Gregg Wallace and Marcus Wareing take on five new chefs and put them through their culinary paces. They'll have to be sharp and quick as this week's challenges include preparing a whelks and winkles dish in twenty minutes. Lord Sugar continues to run the rule over his candidates by tasking them to create an advertising campaign for a soft drink. That's not all, though - they'll have to pitch their idea to experts in New York City. No pressure. Run. It's all hands to the pump as Will tries to protect his team from the aftermath of the DOD leak, Leona fends off a hostile takeover while Don and Sloan talk about where their relationship is heading. The Magician. Nyssa al Ghul (daughter of Batman villain Ra's al Ghul) returns to Starling City, joining forces with Oliver Queen to try and take down the Dark Archer. When Stella (Gillian Anderson) realises that her mistakes has put the life of a witness at stake, the police are forced to step up their investigation with Paul Spector still roaming the streets of Belfast. The second episode of this much-hyped British police drama finds Liz (Brit Marling) presenting her vision of the police force's new digital news channel. Her idea meets opposition when Finn disapproves of it. A Hen in the Wolf House. Coulson and his agents encounter a big problem when Hydra gets wind of an undercover agent, forcing Jemma to tell porkies to Hydra's formidable security chief Bobbi Morse (guest star Adrianne Palicki). Elsewhere, Skye's father (another guest star Kyle MachLachlan, who's wonderfully volatile in this episode) forces Raina to reunite him with his daughter. Danse Vaudou. Constantine isn't showing on any UK TV channel; instead, it's turned up on Amazon's Prime Instant service. After the last episode, where John sacrificed his friend's life to kill a demon, he travels to New Orleans to investigate a series of deaths, and his presence piques the unwanted interest of local Det. Jim Corrigan. This leads him to form an alliance with the duplicitous Papa Midnite to find out who's causing these deaths and put an end to them. Both teams have ground to catch up on Chelsea after less than assured starts to season. Louis Van Gaal will be cursing the international break, one which saw several of his players return injured. Meanwhile, Arsene Wenger will want a result against his rivals, with Danny Welbeck leading the line against his old team. Wales have already suffered a heartbreaking defeat at the hands of Australia this Autumn, and this latest test - against arguably one of the finest ever international teams - won't ease up on the pressure. New Zealand are proving the team to beat at next year's Rugby World Cup, but Wales will be eager to prove that they can mix it with the best the Southern Hemisphere has to offer after all. Ridley Scott's classic gets another airing, but it's a version you may not have seen before. In the 'Director's Cut' (it's more of an alternate cut, we'd say), several scenes are trimmed while we see different versions and altogether new additions. Regardless, the original version was pretty much flawless, this one simply nips and tucks. And that chestbuster scene? Still scary. It's a desert showdown between Lewis Hamilton and Nico Rosberg as the F1 drivers' championship boils down to the last race of the season. With the difference being only 17 points, the much maligned double points rule could come into play. Rosberg will bring some confidence to Abu Dhabi after qualifying ahead of Hamilton before his win at Interlagos, while Hamilton knows that all he needs to do is finish in the top two positions to win the title. But we don't think he'd settle for that. No, this is not the Rob Pattinson-starring film, it's a supernatural three-part mystery in which Michael Palin plays a frail, old Yorkshireman called Tom Parfitt who's moved to nursing home. And his admittance kickstarts a series of strange events. There's more to Parfitt than it seems, but can anyone unravel his past? And what connection does he have to the violent death that marked his first day at the care home?